Prostitutes behind a window in the Yukaku (red light district) of Yoshiwara in Tokyo. 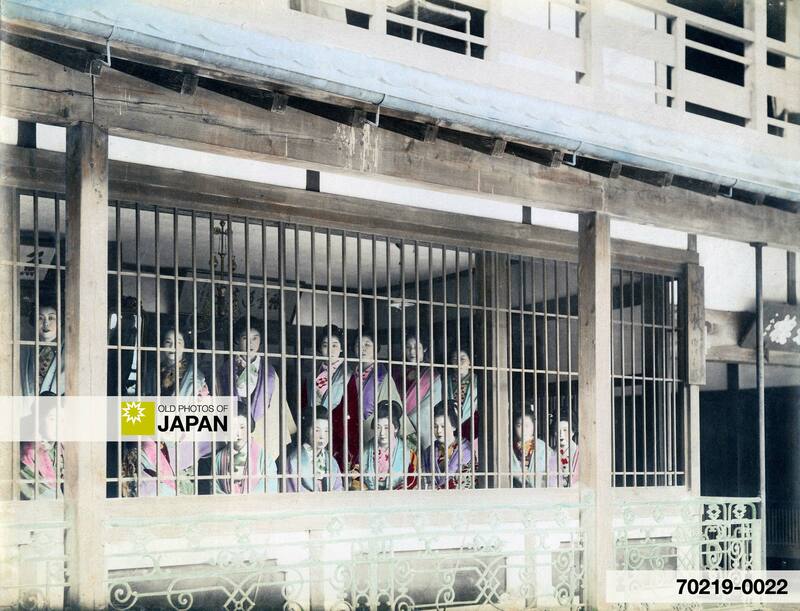 Prostitutes from less expensive brothels were seated behind wooden latticed windows called harimise (張り見世). As a result of intense international pressure, putting prostitutes on display in harimise was prohibited in 1916. For more information about how Yoshiwara worked, read Tokyo 1910s • Yoshiwara Prostitutes and Tokyo 1900s • Yoshiwara Omon. Click Prostitution (Themes) to see all photos of prostitution in Japan. You can also licence this image online: 70219-0022 @ MeijiShowa.com.